So as regular readers are aware last week I gave an invited talk to the Ontario Public Health Association at a Marketing to Children conference. 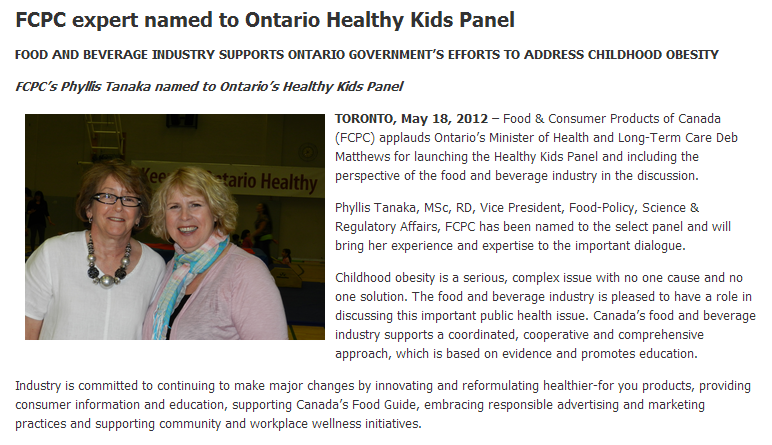 Part of my talk included a screen capture of a press release from Food & Consumer Products of Canada (FCPC) that highlighted the appointment of their Vice President, Food-Policy, Science & Regulatory Affairs, Phyllis Tanaka (that's the screen cap up above, and here's the link to the press release). "are recognized leaders in their fields, possess a broad understanding of childhood obesity, and are connected to different sectors and communities including....consumer products"
"the voice of more than 100 businesses in the consumer packaged goods industry." "promotes sound public policy, champions initiatives that increase productivity and profitable growth and helps to protect the safety and security of the consumer product supply through a commitment to scientific and supply chain excellence and industry best practices." Among the corporations spoken for with the voice of the FCPC are PepsiCo, Mars, Frito Lay, Hershey's, Nestle, McCain - and the list goes on. Now for those who don't know, the definition of a conflict of interest includes even the perception of there being the possibility of a conflict, and given that public health is not part of the mandate of the FCPC, it struck me that Ms. Tanaka's inclusion on the panel was in conflict with the panel's expressed aim. And because Ms. Tanaka was in the audience during my talk, rather than simply flash a photo of her in a press release on screen and have people whisper, I mentioned that she was present when I discussed how I felt the FCPC should never have had a voting seat at a table where the votes would impact on their members' products' sales. I also explicitly pointed out that my statement had nothing to do with Ms. Tanaka as a person, that I didn't know her personally, and that my expectation of any member of that panel would be to represent their professional interests and expertise. I also pointed out that when I testified in front of the panel itself the only person who was furiously taking notes was Ms. Tanaka and I speculated that perhaps it was because my concerns, if acted upon or championed by the panel would be of concern to the FCPC's member corporations. Following my talk Ms. Tanaka corrected me and told me that I had mis-characterized her note taking and that note taking was her habit and she was doing so for her benefit and for the panel. I apologized for the mis-characterization and did not bother pointing out at the time that there were official secretaries present during my talk to the panel. I also asked Ms. Tanaka what would have happened had the panel come out with a recommendation that very negatively impacted upon an FCPC member's product - would that put her in hot water with her boss? She informed me that she was on the panel as an individual, and was not representing the FCPC there. The interaction was cordial. No voices were raised. No names were called. Nor did I ever dispute or question the veracity of Ms. Tanaka's answers to me. Yet the next day the OPHA was contacted by the FCPC's Senior Vice-President Derek Nighbor who was very upset that I mentioned Ms. Tanaka by name during my talk. He demanded that said slide (the one with the FCPC press release congratulating Ms. Tanaka's appointment to the panel - the press release that too names Ms. Tanaka) be redacted from my presentation, that a report be made to the OPHA's Board of Directors, and that a letter of apology be sent to the FCPC and Ms. Tanaka. He also threatened to send a letter of complaint to Health Minister Deb Matthews and to sue the OPHA - though he did not make it clear to the OPHA what grounds the lawsuit would cover. He did not however attend my talk, nor did he attempt to contact me with any of his concerns. I'm writing this blog post to apologize to the OPHA. I'm sorry that me calmly and politely speaking my mind led them to have to expend their time and energy dealing with the FCPC. I also reached out to the FCPC. Not to apologize as truly I don't feel that it was wrong of me to mention a perceived conflict of interest, nor do I feel I was at any point rude or disparaging of Ms. Tanaka, but rather to try to understand what had gone on from their perspective. You'll find below an unedited response from Mr. Nighbor which as is my convention, is presented without commentary from me. I know that I had some blog readers at the talk. Would love their opinion as to whether or not my talk or our question and answer period afterwards was disrespectful, and if it was, I certainly would like to extend my apologies to Ms. Tanaka as disrespecting her was not my intent. My intent was to point out that Frito-Lay's and PepsiCo's interests should never have a vote or even a perceived representation at a public health table due to the clear conflicts of interests involved in the inclusion of food industry representatives in the creation of public health policy involving food. I'd further argue that the reaction of the FCPC to my talk and what strikes me as an attempt to intimidate the OPHA is a clear example of how the food industry and public health aren't on the same team and that were this really about what I said at the conference, it'd have been me receiving the angry phone call and the threats. Thanks for your note and the ability to clarify a few things. Let me be very clear - in my conversation with Ms. Cheng, a formal suit was never threatened against the OPHA. I merely called Ms. Cheng to state my concern about how you questioned Ms. Tanaka's role on the Healthy Kids Panel as part of your presentation at the OPHA event - and that the positioning of your attack could be perceived as slanderous. Ms. Cheng unfortunately misplaced the context of that discussion in her letter which makes it quite misleading. The point I raised with her was my disappointment that, at a public forum, you would use a photo of Ms. Tanaka and name her. To me, it was straight-up inappropriate and a personal attack - as thought a host of others who were there to see the presentation and called to tell me what happened after. Furthermore, I think it's important that you understand - contrary to your suggestions - that Phyllis' role as part of the Ontario Healthy Kids Panel was treated by her with the utmost of confidence - and that was supported and respected by FCPC. Phyllis and our organization took this commitment very seriously - so much so that FCPC and our member companies were not privy to any of the HKP discussions - nor the report before it was released to the general public. Yoni, we will likely disagree on a host of issues, but for me it's about a fair and honest exchange about the issues. Challenge away at some industry practices, debate the issues, let's in some cases simply agree to disagree - but the attacks against specific individuals should be left on the sidelines. Many thanks for reaching out and do contact me directly if there's anything else.